Emoji 11.0 is fixed and prepped for delivery in June. Some of them look promising—useful even. But Anthony Hawk, long-time purveyor of fine video games and friend of Gizmodo, has taken umbrage with the Unicode Consortium’s depiction of his stock and trade. He’s also been given the opportunity to fix it. 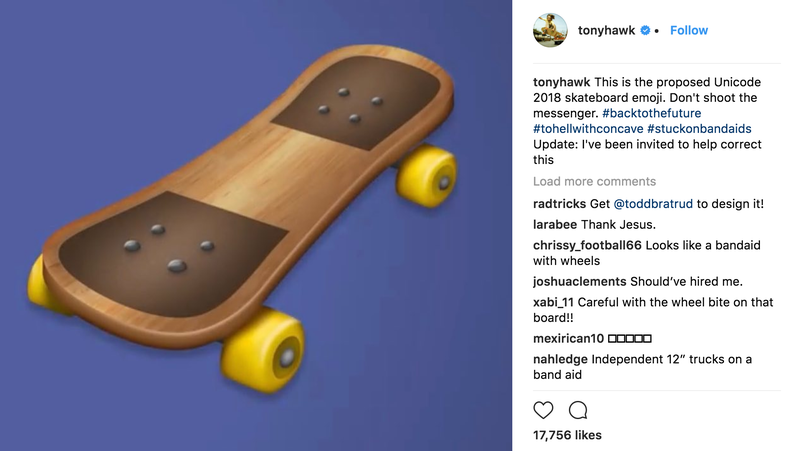 Unicode—who seemingly have never seen a skateboard and just sorta winged it—produced the above sample emoji design: grip tape at the front and back only, a deck that’s oddly pinched in the center, mounting bolts not even close to flush. It’s weird! And approximately three hours ago, Hawk expressed his well-placed frustration to his 3.2 million Instagram followers, and the world waited. Ultimately, of course, the above emoji is just a sample. Apple, Google, and the like will create their own final designs for the emoji as it will appear on your phone. But that doesn’t mean they don’t deserve a template that at least resembles the object in question. Board’s in your court now, Mr. Hawk.